It has to count as the best thing I’ve pulled out of a skip: a piece of Irish limestone, a slab about three feet by one foot by three inches thick. There are no rough surfaces – it’s sawn on six sides – though there are a few chipped edges. Admittedly this is high-end skip-diving, at a monumental mason’s yard, having asked for permission to go through their offcuts – plenty of broken marble and Portland, but only one piece of Kilkenny. It takes a fair amount of shifting of the overburden to reach it, the single pale grey corner that initially caught my eye gradually increasing in size as I get closer. I have to gradually walk it up the spoil to get it out. I can just about lift it. It’s not a perfect rectangle, one of the ends is at a slant and there is a vent along one side, presumably the reason why it was discarded in the first place. Otherwise it’s a good find. What a piece of stone. I’d later understand why it’s so loved by sculptors. It is hard but cuts cleanly. It holds edges well – it will chip rather than crumble. The colour is the thing though: cut it and it’s pale grey, polish it and it goes a glassy black. The two-tone possibilities can be highly effective. I carted that piece of stone around for a while, through a couple of house moves, before I decided what to do with it. However, following a short trip into Herefordshire one summer it became clear what I wanted to do. One church in particular, St Andrew at Bredwardine, had shown me what was possible. At Bredwardine the lintel to the south door (the entrance, not the one on the other side which is also carved) is a lesson in the possibilities of repeated geometric patterns. In its centre there is one giant rosette or hexafoil motif similar to the ones in some Devon churches on the fonts at Harberton or Buckland-in-the moor, or on a capital at Hawkchurch. This one, however, is divided so that each spoke or petal crosses a dividing line into an outer ring. Between each point in the outer circle there are smaller circles, each one containing a four-pointed star. 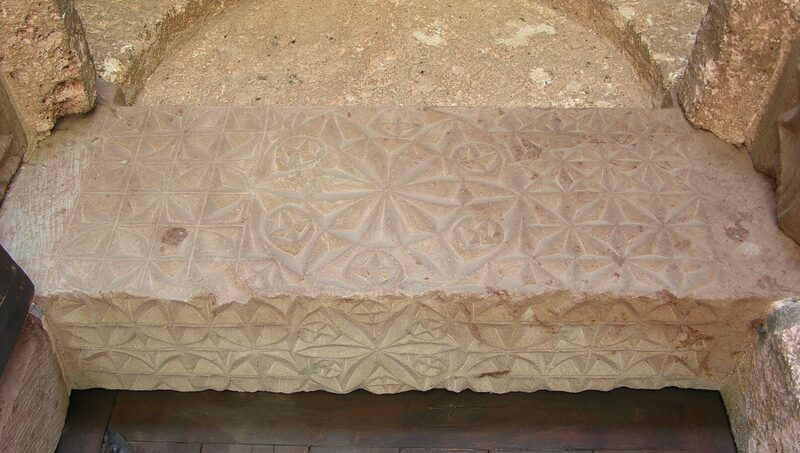 On each side of the rosette the remaining space of the lintel is carved with massed star and variants of star patterns. Even underneath the design is carried on, the entire surface covered. Look at it long enough and new patterns are formed from the building blocks of each square. It is an incredible piece of work showing the potential of simple motifs and their repetition. As soon as I could I started to carve test pieces of star motifs on different offcuts of stone, just to get the pattern into my hands. Then a few days later I drew the design onto the slab. Star ornament isn’t difficult to set out. First, you only really need a square with two diagonal lines crossing in the middle to work from. Each quarter (which is a right-angled triangle) becomes a shallow, sunken, unequal-sided pyramid in effect, as you carve each face at the same angle. Do this for each quarter, twelve faces, and you have one four-pointed Romanesque star. Second, the design is able to accommodate all manner of imperfectly shaped stones. So long as there can be a four-sided shape drawn onto it, or squeezed into a corner, it is possible to produce a star motif. On my slab of Kilkenny limestone I was going to do thirty of approximately similar size, three rows of ten. The slight angle at one end of the slab could be easily accommodated by stretching the design; one point of some stars would appear slightly longer than the others. Like the carvers at Bredwardine who had placed a hexafoil in the middle of star motifs the shape of the stone or other designs could be taken into account. Perhaps this is why this particular motif was so favoured by the twelfth-century carvers; it is enormously flexible. I carved it in my friend’s studio on the edge of Dartmoor over several months, a day here, a day there, whenever I could arrange time to get there, averaging three to four stars per visit. ‘Edge’ of Dartmoor doesn’t really do the location any justice – the gate to the moor is right next to it, a former barn now carpeted in white marble dust and stacked with pieces of stone; Portland, Carrara, Spanish alabaster. Sometimes I’d cycle there from where I lived in Ashburton, taking a short cut through the grounds of Buckfast Abbey and up the ridiculously steep hills behind Scoriton and Combe, several miles of gradient. Where you make something is as important as the making. The studio itself, remote and at the end of an unsurfaced road, the weather, my journey there, the conversations we might have, all went into the stone in some way, which itself drew upon a long heritage of decorated lintels and steles, grave slabs and architectural sculpture. Centuries of working practice, not to mention daily life, live in each project. While sculpture, like other artistic practices, can bend itself into the shapes of words it takes its life from the sensory realms beneath and beyond them. These ‘empty spaces where art happens’, as the novelist Russell Hoban would say, are impossible to quantify. It can be difficult to know, let alone explain, the feelings a work inspires, not just during its making but in the life it then takes on when finished, separate to the circumstances in which it was produced. Philip Rawson suggests that this is due to the complex connections between memory and sense experience that live on in the depths of our minds and inhabit similar realms to those in which ‘creative art moves’. Those works of art that resonate with these submerged memory-traces are like powerful beams of light illuminating forgotten or hard to reach aspects of ourselves. With each new star carved the pattern on the stone became more and more complex, new lines and shadows confusing the eye. Some days I would be dazzled by the thing and unable to focus properly. I was particularly excited to finish it. The raw, cut surfaces, textured with my chisel marks, were pale grey. At the edges, where I’d polished it, the grey deepened to a charcoal black. Richard Sennett, writing about the emotional rewards of craftsmanship, notes that the process of engaging with a given material means that ‘people are anchored in tangible reality, and they can take pride in their work’. This, I think, is true. Connecting with tangible reality is the lightning rod that brings us out of the ether and fully into the here and now. Pride in your work comes from knowing that a part of you, perhaps an unknown, secretive part, invisible in daily life, recognises a suitably good piece of work to inhabit. The stones are spirit traps still.